Live chat, sales automation, AI, bots - whatever you want to call this movement of instant connection, it is going to change the world of sales and marketing forever. The ability for a prospect or customer to instantly interact with your team is insanely valuable and consistent with the inbound methodology of putting the customer first. Let me tell you a story to explain my point. I researched live chat software, sales automation software, basically anything that allows a prospect to directly talk with someone on their website. I did this because it’s the future; it’s one of the big things we talked about at INBOUND last year, and it’s the logical next step in terms of efficient sales machines. There are a couple different flavors of this. Today, I’m primarily going to be looking at Drift. Full disclosure: Drift is a platform we’re trying out now. To answer this question, the first move I made was to navigate to Drift’s website. I knew what I wanted, but I didn’t know where to find it. After a quick back and forth with the bot, I was connected to a real human, Connor. He gave me a handful of resources that were super helpful, and he did it within a couple minutes. He was able to do that so quickly because he was set up by the right technology. 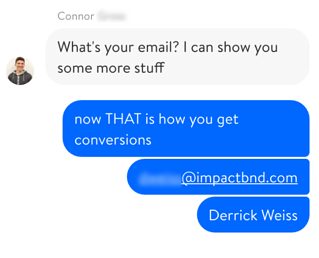 I initiated the conversion with Driftbot and it qualified me enough to allow Connor to step in so that he could help me out. Thanks, Connor! You can’t really achieve the same personal touch on your website or in an email, but using live chat, in this format, in this decade, you can -- and you should. You. Anyone in a sales or marketing seat. More specifically, the person between the sales and marketing teams, like a Business Development Representative. The way I look at it, live chat is essentially taking the millennial mindset of always being connected and applying it to business conversations for profit. Your website is your biggest marketing asset, but also a strong sales asset. Different parts of your website manage different parts of your funnel. Live chat and automation take this to the next level in a way that is getting more and more successful. A great example Connor shared with me is The 2017 Drift Lead Response Survey, which points out that the fastest responders to sales inquiries are much more likely to get the sale. The ten fastest responders had live chat, which allowed them to connect with their prospects in real time. By the transitive property (and data collected by Drift, AMA, amongst others), live chat leads to increased sales. ...is what your prospects are thinking when they are on your website. Live chat allows prospects to connect when they want to connect, instead of responding to a salesperson’s follow up email, phone call, or basket of fruit. Also, when you’re talking to them, there’s no reason to wait until you’re on a sales call to address obstacles. Most prospects will just bring them up and usually the biggest ones first. Talking with your customers, prospects, and potential job applicants on your website removes a lot of the back and forth that has become a necessary evil in today’s business world. I don’t want to get on the phone with someone who is going to sell me something - mostly because they are going to try to sell me something. Live chat is completely different. It requires far less of a commitment from the prospect and can be done conveniently from their desk while they’re working on something else. Eliminating friction between your company and your customers or prospects is one of the strongest benefits of live chat. If a customer needs help with your product or service, the fastest and easiest way for them to get in touch with you is via live chat. In fact, eDigital’s Customer Service Benchmark Survey found that live chat had the highest levels of customer satisfaction and it makes sense; it’s just easier than picking up the phone or sending an email. 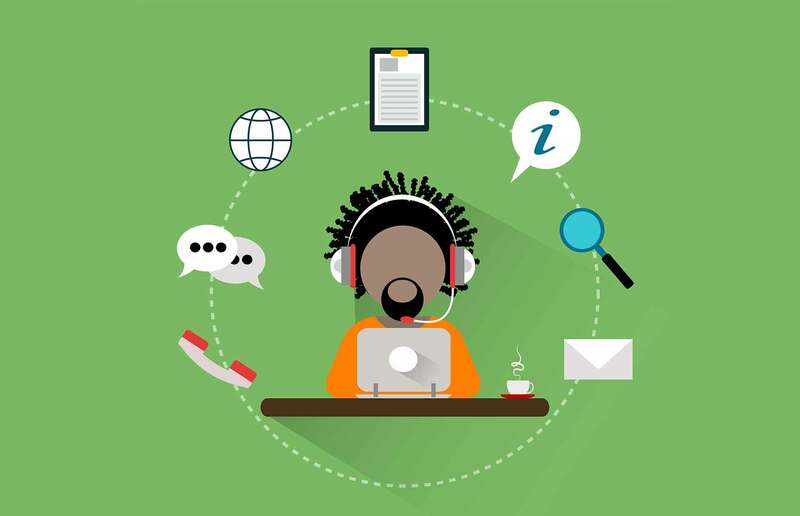 With the proper training, a customer service representative can wow your customers in real time on live chat, possibly more effectively than they could even over the phone. Similarly, live chat has a lot of benefits for shortening the sales cycle. When you go to our pricing page, you might see a chat box in the bottom right-hand corner. It’s there to answer any questions you might have about our pricing, because the pricing of our services is usually something that Tom, Nick, and Kyle address in the sales process. If we can answer your questions sooner, or understand what you’re thinking before we even enter into the sales process, it’s going to make it much easier for us to work together. Now, live chat is certainly nothing new. Most of us have been using online instant messaging since our junior high school days and it’s been in use by eCommerce sites as early as the late 1990s, but the technology and its abilities have advanced dramatically in the last few years. With live chat, you can now reach out proactively to someone visiting your site. In other words, you can have the chat automatically start a conversation after they’ve been on the page for a certain amount of time or they’ve clicked onto a specific topic. You can even sync your CRM or marketing automation platform to your live chat software and know exactly who is visiting your site, what they’ve seen, and any interactions they’ve had with your company previously. Drift is a great example of how you can automate your business development process in a way that makes it contextual and inbound-y. 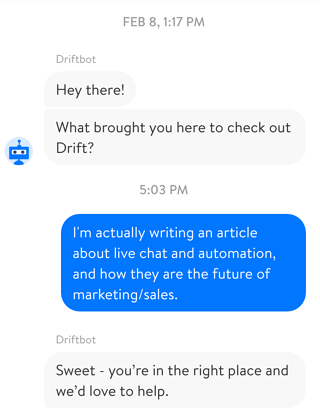 They officially call their bot, Driftbot, an ‘intelligent sales assistant,’ which makes sense to me. It has the ability to respond to inquiries based on specific keywords using a message that you create and automatically qualifies chatters on your website, allowing a member of your team to connect with them. All of this saves you time and energy by helping you only work or connect with the highest priority leads first. Very few companies are using live chat right now. Even fewer companies are using to effectively shorten their sales process, convert leads, or generate more business. However, for organizations that are using it, there are plenty of experts in the field to learn from. Olark is one solid example of this. Their blog talks about very specific scenarios in which live chat can be part of the solution, and gives tips for chatting. Ever used Facebook Messenger? Or the chat in Snapchat? Of course, you have. Live chats are becoming more and more prevalent on popular tools and social networks your buyers are already using. In fact, Facebook recently opened its doors to sponsored automated messaging. Coupled with Dharmesh Shah’s interest in creating AI and bots, it won’t be long before you’re getting automated messages that are helpful, relevant, and not spammy at all. While not as easily capturable as filming a video or advertising on Facebook, chat bots and live chat are going to make some large splashes in 2017, so don’t be left behind. Install some live chat or sales automation software on your site.They are usually free to try, so, try it out. After all, AI is here to save your career, not destroy it.